2 Br Gem Within Within Walking Distance For All Your Needs! You are booking an amazing condo on the ground floor. About 1,250sq/ft with keyless entrance for total privacy and 24 hour check in. You can come as go as you please. The Condo has plenty of windows and natural light, 2 large bedrooms with 2 full baths, and lots of room to roam in the common areas: complete kitchen, eating area, living room and outdoor private patio for you to grill out! You can walk to the grocery store and many restaurants! Close to Tangle wood park and Winston Salem. 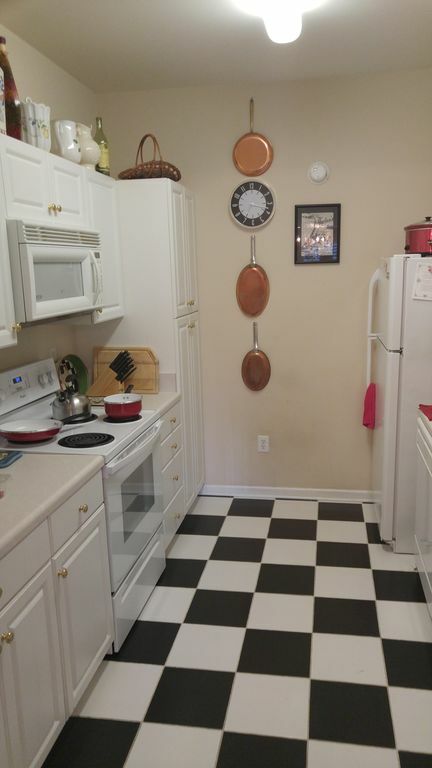 The condo has a fold out twin bed and a electric blow up queen bed as well.Nature all around within minutes from mayor highways, and less than 10 minutes from Wake Forest University, hospitals and downtown. The average age in this community is around 64 years old. Additionally, there are about six police officers that live in the area and park their police cars in plain site! I will supply complimentary regular coffee, decaf, tea, hot chocolate, and cider. You will be set up with all the staples you will need for cooking! I have a card table and extra chairs. The Wi-Fi works great! Very Good signal! There is a handicap parking space for your use. We really enjoyed our stay here - it was the perfect location for a wedding at the nearby country club. There was an abundance of food and toiletry items provided for our use which was very convenient and the home was clean. It was lovely to have a comfortable King bed for our use! Leslie, your group was awesome to host. Thank you for taking such good care of my place. I'd love to have you guys back. Wonderful, Clean, Spacious Condo, and Amazing Host! My son was getting married at the WinMock and I was so happy when I found this place so close to the venue. Originally, I was going to stay here with my husband and daughter but when I found out my cousin, her husband, two kids, and her mom were coming to the wedding, I couldn't resist offering her the place instead. When I first got to the condo, I didn't know what I was thinking giving up this place and getting stuck in a hotel room; but when I saw how ecstatic my cousin was when she got here, it felt so good giving it up. She was sooooo very thankful she had a kitchen and didn't have to stay in a cramped up hotel room with her two little ones. I've stayed in many Home Away's but this was by far the best host I have ever experienced. Thad was amazing and so helpful. I would 1000% recommend staying here rather than a nearby hotel. Thank you, Thad, for going out of your way and making us feel so welcomed in your home! Thank you for all your kinds words. You guys were awesome! You left my place spotless. Welcome back anytime. My family and I stayed here for a wedding and it was perfect!!! Thaddeus was very accommodating and provided everything you could need or want for your stay. My family kept thanking me for finding the condo because a hotel room would not have been the same plus would have cost more then double the amount without the added touches. I now have a place to get away to when visiting family in the area. The pool was perfect as well and just steps away from your front door. Thank you Thaddeus for everything! Deanna, you guys were great! Always welcome back. Thank you for leaving my place spotless. You were a peach to work with as well! great value. Thad was great and very accommodating. The only thing I would improve would be the size of the TV. Had a great experience. Thank you Thad! Thank you for all your kind words. You guys are welcome to stay with me anytime!